While some baby cribs, cradles, bassinets and toddler beds come with a mattress provided, this isn’t the case for all of them, and many parents find that the ones provided aren’t as comfortable as mattresses bought separately (this is especially true for travel cribs). A good baby mattress is soft enough to be comfortable but the best and safest crib mattress is one that is FIRM. A standard baby mattress is 25 x 52 inches in order to fit standard sized cribs. If your crib isn’t the standard size you will have to look carefully when choosing which crib mattress to buy, and you might even need one custom made. 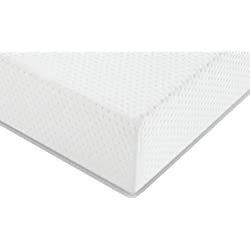 The size is certainly not something that you can ignore: baby crib mattress measurements are important because if there is too much space between the edges of the mattress and the sides of the crib it is dangerous as body parts can get stuck. A gap of 1.5 inches (4cm) or more is considered too big and therefore a risk to your baby. A brand new baby crib mattress doesn’t have to cost you an arm and a leg! 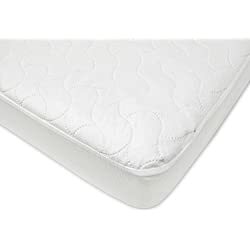 You can find an inexpensive crib mattress online or in shops, and they will comply with safety regulations as they are obliged, by law, to meet certain standards in order to be sold. That said, problems can be found out later on so if you’re looking at older versions, check that the model hasn’t been recalled by simply looking online. 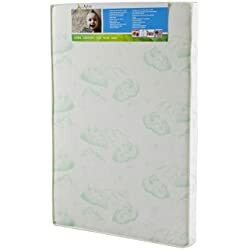 Baby mattress price does vary, like I said, so you could probably find a new crib mattress for around 50$, but they can also cost yo hundreds of dollars. If you’re going to fork out more, you could consider selling it on when you have finished with it in order to make some money back. Similarly, you could use the same one for your future babies, if you plan on having more children further down the line. 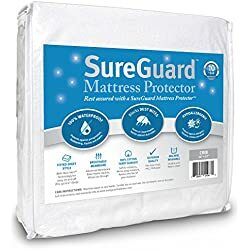 Note: It’s worth pointing out that a mattress shell isn’t the best thing for a baby to sleep on so adding a waterproof mattress pad saves washing the mattress shell and adds comfort for your baby. 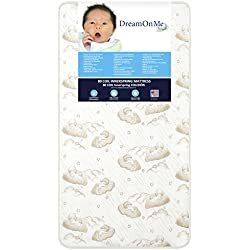 It’s a great way to use this comfortable, inexpensive crib mattress without the worry of regularly washing the mattress cover itself. 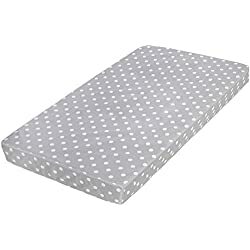 Smaller mattresses are great for travel cribs, cradles and bassinets and any kind of pack n play or play yard.